Kansas City's First Fully Certified Collision Center! 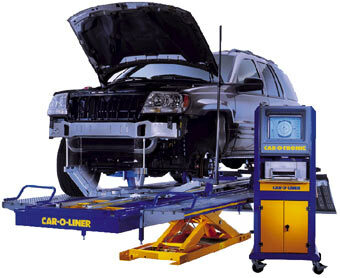 Today's car manufacturers require the use of a special frame straightening machine to correct structural damage. We use today's best systems like those found in their automotive training centers and factories. In about half of collisions there is some degree of frame damage. It could just be the bumper mounting member that's bent of the damage could be extensive enough to require the replacement of a part or all of a frame rail. Frame repair not only involves restoring frame components to their original dimensions, but also to their original strength. Where metal is bent it becomes hardened in the bend where the molecules are pushed together. Through a process called stress relief, the molecules are arranged back to their original configuration and the steel is restored to its original strength. This type of repair is done on a frame machine which is a platform onto which the vehicle can be clamped. It also uses hydraulic rams which will pull with a force of up to 20,000 lbs. Along with the devices for pulling, a measuring system is utilized. A common system uses a laser and reflective targets which are accurate to within one millimeter. This system can be used live and the dimensions of the vehicle can be monitored during the pull. The vehicle is measured in three dimensions; height, width and length. Once the frame has been restored to its original condition, all other parts will fit and the wheels will align correctly. We do frame and structural work for many area body shops.